A super evening at our May Business & Professional Women Langley Dinner Meeting! Everything went like clockwork despite the fact I could not find the gavel from my move – probably packed away in a box somewhere, lol. We were delighted to have special guests from BPW BC & Yukon, Heather Mary Stewart, President and Barbara Fehrmann, Secretary. 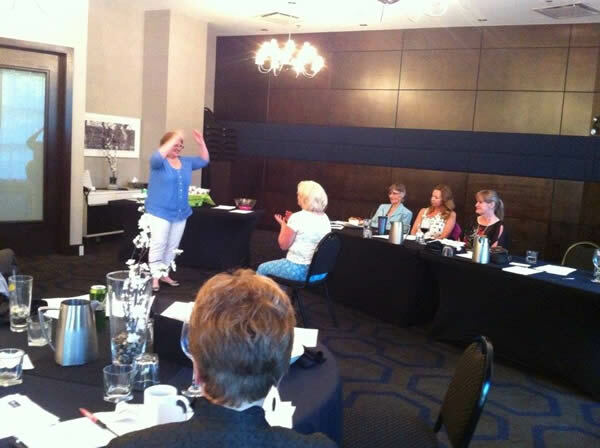 Heather told us about the upcoming Provincial BPW AGM on June 13th – a jam packed day ending with an evening celebration that is sure to be spectacular. You are welcome to observe the AGM proceedings and everyone is invited to the AGM Dinner and Silent Auction with special guest speaker. Jenny Gulamani-Abdulla, BA, J.D., Immigration Consultant and BPW Canada 1st Vice President will speak on Equal Pay for Women. This event is open to BPW members, supporters and all other members of the public. Jenny has already travelled widely for BPW, most recently to New York City where she represented BPW Canada, joining our national president, Coleen Allan at the BPW International Leadership Summit in March, 2015. For more information about the June 13th Dinner, click here. We had informative member spotlights by May Stokes and Bonnie Goldstone and our guest spotlight was provided by none other than Michael Harris – yes, men are welcome too, and do attend our meetings! Our guest speaker Catherine Simmons spoke from the heart about her mental health crisis and being diagnosed with Bipolar Disorder and how she was able to heal and the role our thoughts and emotions play in our physical well-being and quality of life. She talked about the importance of accepting ourselves and how to attract what you want into your life – not to force it and to just let it flow. She also did an amazing EFT demonstration with member Camille Bowling who came to the meeting with neck pain from a fall just prior and the pain went from a 7/8 out of 10 in intensity to a 2/3. The mind and neural pathways are fascinating to me. Tracy Scanks, our 1st VP gave an update on the Advocacy Committee. Lots of plans in the works and the next Advocacy Committee meeting will be held at the Murrayville Pub at 6 pm on June 3rd. If you would like to help women in need please let Tracy know in an email to: tracy@proconadvantage.com. Our next monthly dinner meeting is on Wednesday, June 17th. As well as our AGM, it will be our year wind-up and social (we do not meet in July & August). A fun night with a bit of a departure from our regular meeting as we will not have a guest speaker. Plan on doing some networking, mingling and brainstorming with us. We still have a spot open for one member spotlight. Contact us if you would like to be that one. The guest spotlight will be drawn from any guests that put their name in on the night. Thanks again BPW Langley for another great evening! BPW Langley President and your Servant-Leader. admin on September BPW Meeting Bumpy But Fun! Dale Choquette on September BPW Meeting Bumpy But Fun!